Do you love to run? Do you love to socialize? Do you love free stuff? Be a Pint Strider! 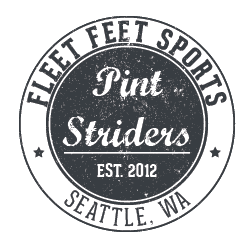 Find the next Pint Striders Run on our Facebook page! If you haven't already, complete the online waiver for our Pint Striders series. You only have to do this once, regardless of how many Pint Strider runs you attend.